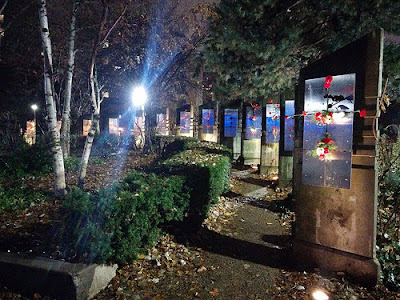 Early on the evening of the 1st of December in Toronto, on World AIDS Day, I stopped by the AIDS Memorial. Fresh red and white carnations were woven among the panels as citylight gleamed in the background. Many of the assembly of links I posted this evening over at my personal blog relating to World AIDS Day dealt with how it was being remembered. Others dealt with successful approaches to the epidemic, to the growing recognition that people being successfully treated cannot transmit HIV to other partners and to public-health approaches like that of Demetre Daskalakis in New York City which destigmatize HIV and make it manageable in a social sense as well as in a medical sense. Still others deal with how, in Russia, prevailing social conservatism is contributing to an accelerated spread of HIV; the Russian Demographics Blog noted the alarming shape of the HIV epidemic in Europe, with increasing success in the European Union being more than counterbalanced by an expansion of the epidemic in Russia. As for HIV and AIDS, my thinking on this pandemic is dominated by two approaches. 1. As was made clear to me by Jacques Pepin's The Origins of AIDS, which not just traced the modern pandemic to a zoonosis in the interior of central Africa but outlined how a chance configuration of historical events led not only to the HIV pandemic but to the particular shape of the pandemic, the extent to which global catastrophes can be created by chance occurrences is appalling. What catastrophes, epidemiological or otherwise, have been unleashed on an unknowing world now? There may be good sense to the precautionary principle. 2. I remain impressed by the fact, realized by me in a 2016 visit to the AIDS Memorial, that biomedical intervention of a sort that would have been science-fictional in the 1980s can successfully control even HIV. What explanations--what explanations, more, that are not excuses--can there be for this pandemic's survival? If, as an early observer of HIV and AIDS noted, the epidemic immediately showed up the weak points in public health at every level, it still does this now.